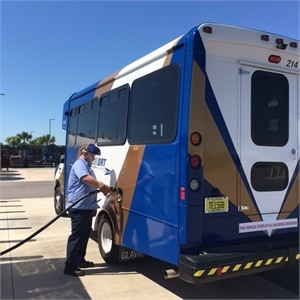 With a 20% reduction in fuel costs, Fort Myers, Fla.'s Lee County Transit (LeeTran) has added more propane autogas-fueled shuttles to its paratransit fleet this month. These new vehicles increase the public transit agency’s propane fleet to 20, or 45% of its entire paratransit fleet. LeeTran provides approximately four million rides per year, including over 100,000 passenger trips through its Passport service. The propane autogas paratransit shuttles will be used for shared ride, advanced reservation trips for persons with disabilities who are unable to use regular fixed route public transportation. Each of the agency’s Passport shuttles, which travel 30,000 miles per year, is built on the Ford E-450 chassis with 6.8L V10 engine, and equipped with a ROUSH CleanTech propane autogas fuel system with extended range 64-usable-gallon fuel tank. “LeeTran wanted to reduce its emissions and operating cost without compromising range for its paratransit fleet. 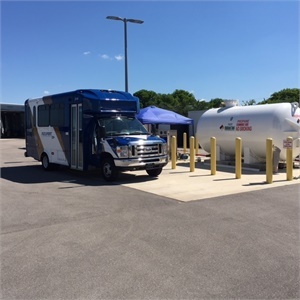 Our extended range fuel tank on the E-450 is exactly what the agency was looking for,” said Todd Mouw, VP, sales and marketing, for ROUSH CleanTech. By fueling with propane autogas, LeeTran is eliminating 1.8 million pounds of carbon dioxide over the shuttles’ lifetime, compared to conventionally fueled counterparts. The ROUSH CleanTech Ford E-450 shuttle bus has completed Federal Transit Administration’s New Model Bus Testing Program (Altoona Testing) and is certified for sale in all 50 states by the California Air Resources Board and Environmental Protection Agency. Altoona-tested vehicles can be purchased using a transit agency’s FTA funds. LeeTran secured FTA funding to cover 85% of the total bus purchase. Lee Tran plans to switch its entire paratransit fleet to propane autogas within the next five years.